Trying to work on your Spanish? Want to improve your vocabulary and Spanish speaking skills? 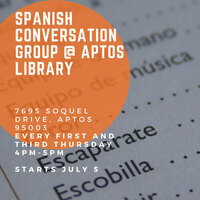 The Aptos Branch Library is now hosting a Spanish conversation group. Facilitator-led discussion and activities. All levels are welcome, including beginners. Meetings are every first and third Thursday of the month.